36 x 48 inches, oil on canvas over panel, 2015. Image courtesy of the artist and CB1 Gallery. Lisa Adams, "America the Beautiful"
Over the course of nearly a decade, Installation Magazine Editor-in-Chief A. Moret has followed the artistic practice of Lisa Adams. On the heels of her forthcoming solo exhibition America the Beautiful, visual anchors that have appeared in previous bodies of work are coming together to form a visual reliquary that speaks to the dystopian paradise that Adams explores each day. In Esperanza Way we are reacquainted with an ominous cloudscape with a splinter of light piercing into the frame. The landscape first appeared in Adams’ previous solo exhibition Second Life which featured A Mire of Epiphany at its narrative core, as it spoke to the artist’s temporary loss of vision. 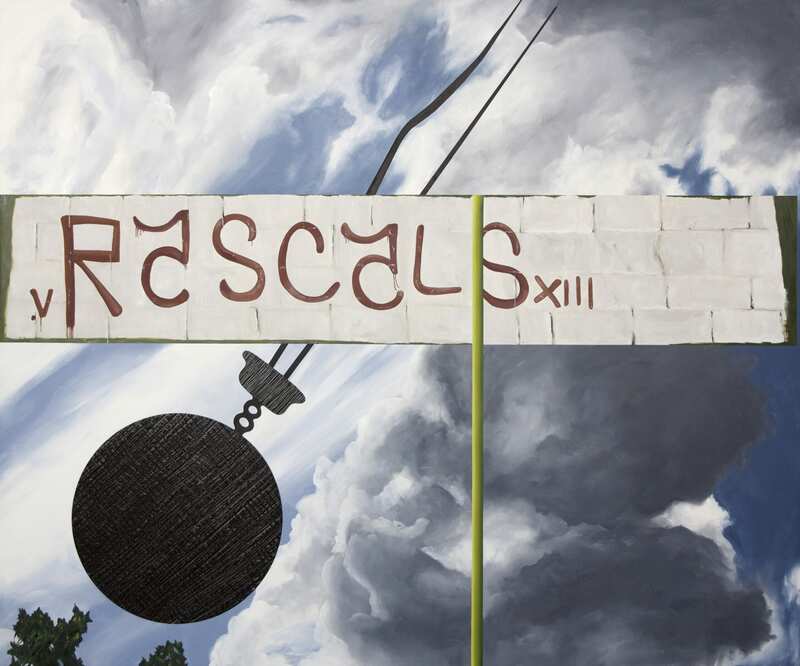 Now a wrecking ball rendered in circles of paint butter breaks through a found graffiti tag bearing the name “Rascals,” which harkens to a 2008 work We Destroyed the Things We Loved. In the juxtaposition of prosperity and destruction, decay and possibility, Adams realizes a new landscape in America the Beautiful. How did you arrive at the title America the Beautiful? As you could have guessed the title is sort of tongue-in-cheek. There is a lot of beauty but we’re also in a period of decline and that’s what I’m trying to say. Things are kind of moving around and you do see a lot of hopeful and beautiful things combined or juxtaposed or sitting right next to things that are completely beaten and broken. I think that for me is the most fascinating part of just looking out onto the world- that jarring contrast. Your previous solo exhibition Second Life challenged you tremendously on a personal level as it marked a period of time that you lost your sight. Do you feel that you have a new “vision” for America? I think coming out of Second Life was a pretty deep experience for me. It’s something I certainly don’t take for granted, meaning my eyesight. And it seemed almost like I had an even bigger responsibility to depict what I visualize and absorb from the environment in front me. My surroundings have become much more acute visually and I’m sure that has something to do with my vision being restored. Borderland marks a new moment in your work- the first time a human subject has entered your canvas. We are used to birds and flowers as subjects but never people. What prompted this decision? You know it is the first time a person has ever appeared in a painting and I think it had something to do with the scale of the painting this time. The painting felt very epic to me and it seemed only reasonable that there be a depiction of an isolated person standing, facing what is left of America or what they see through those binoculars as the remains of America. 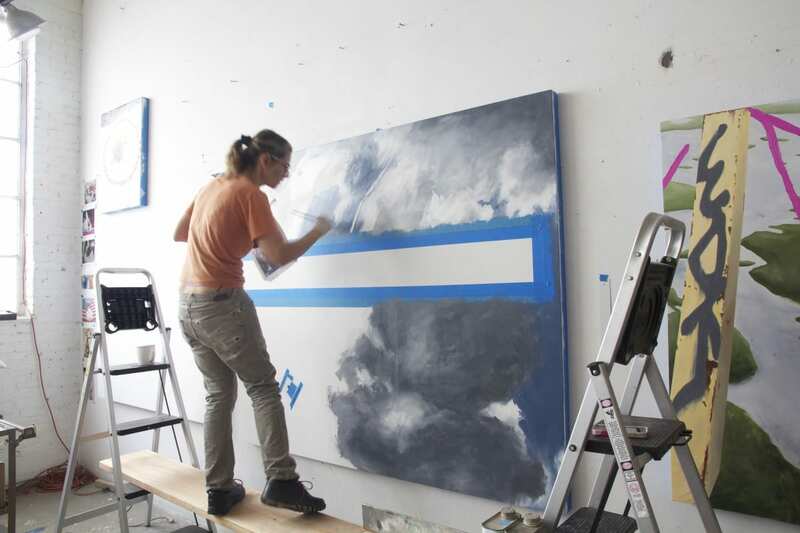 Lisa Adams in the studio painting Borderland. Photograph by Jayme Odgers. 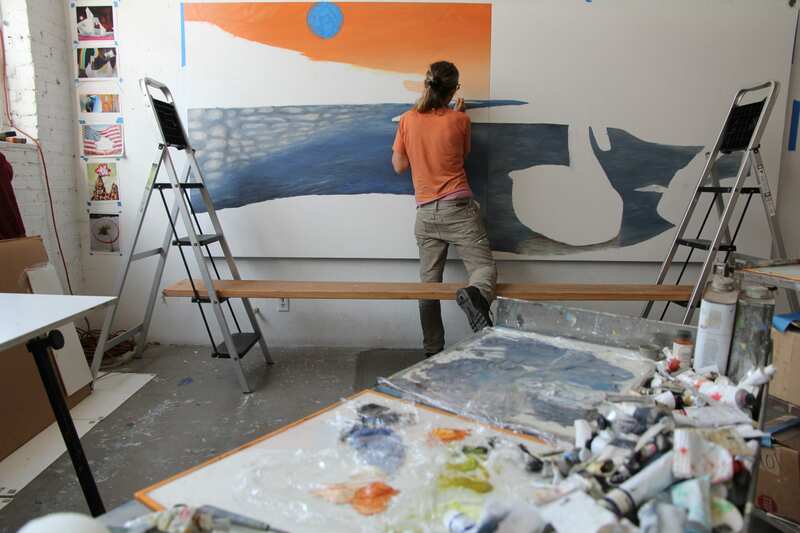 Lisa Adams in the studio painting Esperanza Valley. Photograph by Jayme Odgers. America the Beautiful is on view at CB1 Gallery from 12 September- 31 October 2015. Artists: Lisa Adams  Archived in Art, Contemporary, Creative and tagged America the Beautiful, American flag, canvas, CB1 Gallery, graffiti, Lisa Adams, Los Angeles, Oil, Second Life, Vision. Bookmark the permalink.